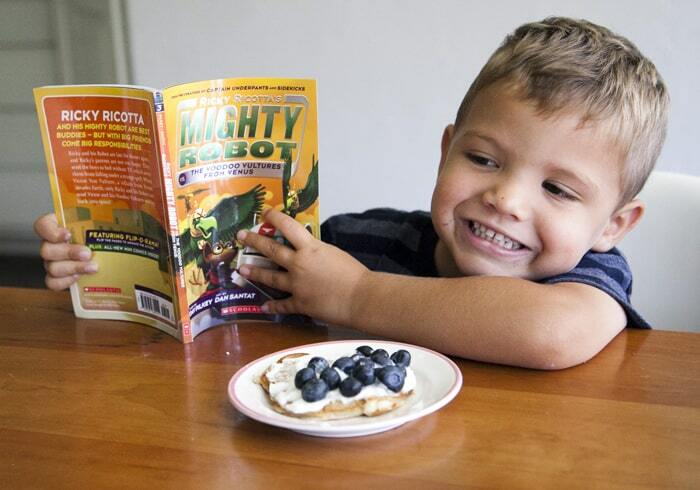 Sponsored & Inspired by the Ricky Ricotta Series by Dav Pilkey. 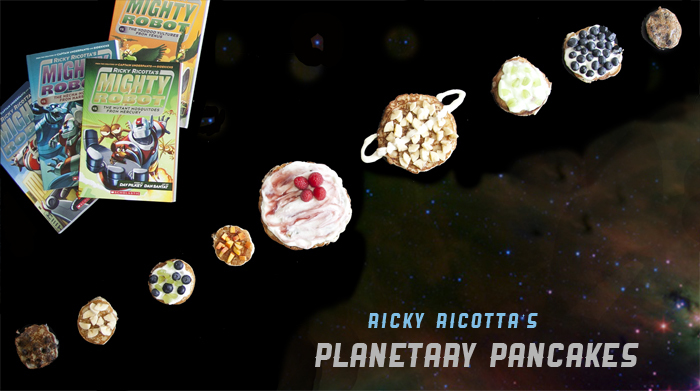 Before we get into the most awesome Ricky Ricotta, or the deliciousness of Ricotta Pancakes, or your impending family bonding time spent making breakfast that looks like the solar system, let’s discuss Pluto. Yes, I included Pluto and I am sorry(ish). I know it’s not right but my heart will always belong to little Pluto and so it has a place amongst my pancake planets. Feel free to lop off the little guy if you care about things like “accuracy” and “science.” Now let’s get back to the most fun you will have with breakfast in a few light years. When we were invited to create a project inspired by the new full-color series of Ricky Ricotta books by Dav Pilkey (Captain Underpants, The Paperboy,) we knew it had to celebrate our kid’s love of outer space. 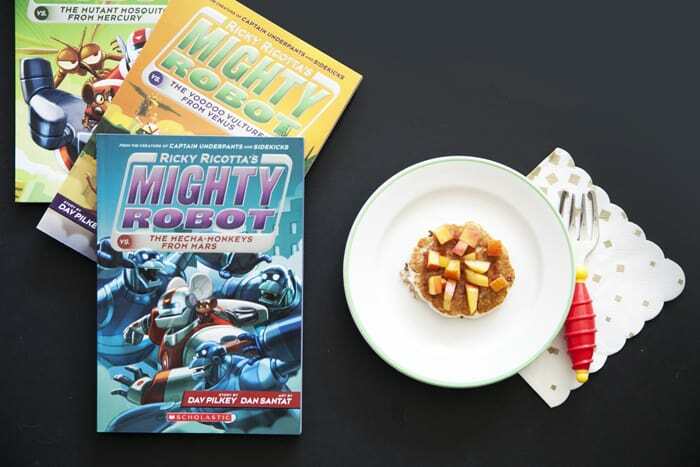 In each book, Ricky and his giant flying robot bestie outwit aliens from a new planet in our solar system to keep Earth safe. 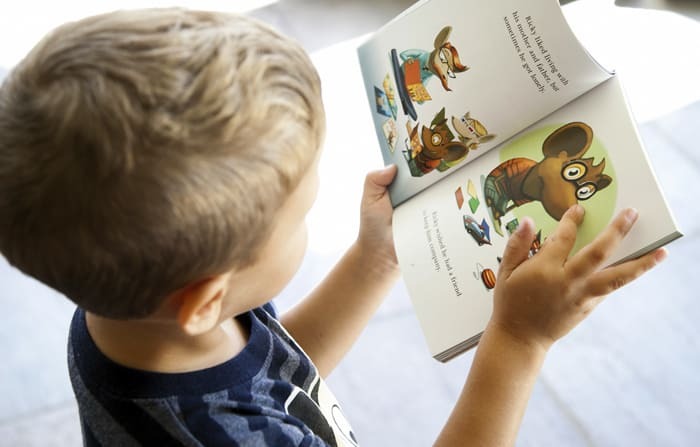 My reading-aged children love the comic strip format and even 3 year old Gordon can enjoy the stories by following the cartoons… with a side of pancakes of course. First up, make a batch of your favorite Ricotta Pancake batter. Heat a pan or griddle to medium & brush with butter. Working in batches, make pancakes in a variety of sizes using batter anywhere from 1/3 cup to a tablespoon to get planetary variety. Cook pancakes approximately 3 minutes per side, watching for bubbles to pop up in the center, that’s when you know it’s time to flip! Now that you have a stack of delicious ricotta pancakes, gather and chop your toppings. Get creative with what you have on hand. No need to break the bank buying every fruit in the galaxy. It’s time for fun. Together with the kiddos, arrange your variety of pancakes in order of planetary size and get to work piling them high with yummy toppings. 1. Admire your work. 2. Take an Instagram photo. 3. Dive on top of them like a pack of wild monkeys because Ricotta Pancakes are amazingly delicious. 4. 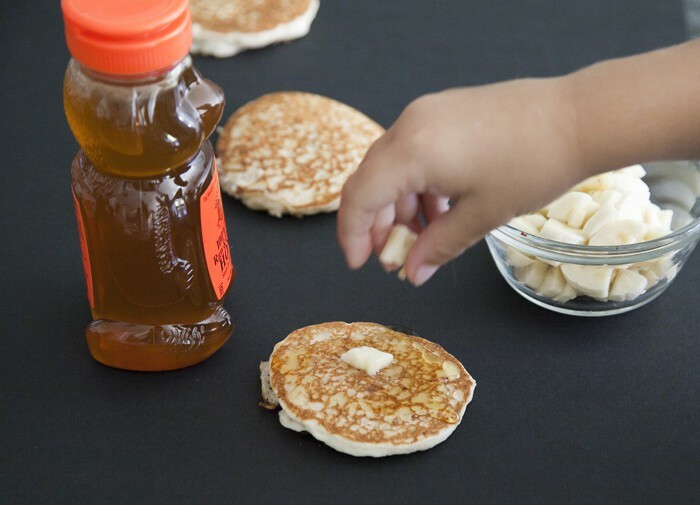 Brainstorm how you can incorporate more scrumptious breakfast foods in your family science lessons.